As a disability rights advocate and person who well remembers the palpable fear I felt for my family when we were uninsured and who has depended on Medicaid in the past, I’ve been following the development of the American Health Care Act (AHCA) closely. I strongly oppose the AHCA. It is a Very Bad Thing. Even Trump has called it “mean.” Rand Paul called it a “deplorable” subsidy for insurance companies. 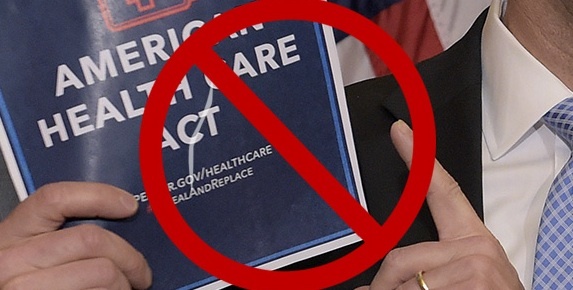 The Congressional Budget Office projects that the AHCA would raise the uninsured rate by 23 million by 2026, leaving 18.6% of the US population uninsured. The AHCA would gut Medicaid, the program that covers 1 in 5 USAmericans. The program that’s expanded coverage to more than 15 million people since the Affordable Care Act (ACA, aka ‘Obamacare’) was first implemented in 2013. A program that currently covers 45% of US births (on average, up to almost 70% in some states) and more than 10 million people with disabilities. The AHCA would also institute waivers that would allow insurance companies to significantly increase charges to older people and eliminate essential benefits like maternity and mental health care and prescription drugs. It would usher in insurance caps that would limit the benefits a person could utilize in their lifetime. It would eliminate federal funding for Planned Parenthood, a lifeline for primary care and family planning for so many women, *especially* uninsured women. Health care is a human right. Without access to health care, people die. They get sick, not just from the lack of medical attention but from the stress of living a precarious existence and managing expensive–often ruinous–medical bills. If the AHCA passes, people will lose access to health care and services that keep them alive, in their homes, and active in their communities, that enable them to go to school and to work. People will lose quality care and face institutionalization and homelessness. People will die. Image description: A Tweet dated 9 May 2017 from @StacyLeMelle shows a line of people against a wall holding signs that look like tombstones. They read: “RIP LOST MEDICAID NO $ FOR CARE,” “DEATH BY 1000 MEDICAID CUTS,” RIP DEATH BY SUICIDE LOST MENTAL HEALTH CARE,” “COULDN’T AFFORD ASTHMA CARE,” “RIP CHOSE RENT OVER MEDS,” and “RIP COULDN’T AFFORD THE COST OF BEING A WOMAN.” More protesters with signs extend beyond the left edge of the image. So, yeah. I’ve been consuming and producing a fair amount of discourse about the AHCA lately. I’ve been calling my representatives and tweeting a lot about #AHCA. I’ve been reading lots of newspaper and web coverage. I’ve been seeking out and amplifying the voices of people with disabilities who share how this bill will affect them. While I’ve done a fair amount to express my own views and spread important perspectives in the debate , I feel like it’s not doing anything to slow the Existential Threat at hand. And while I’ve done a fair amount to educate myself about the AHCA, I’ve done so in a political echo chamber of my own curation. I haven’t sought out voices I don’t agree with. I’ve been responding to a crisis, scrambling to learn as much as I can and struggling to process all that I’m learning along with the rage and heartbreak it brings on. And I’ve turned to stories and storytelling as a strategy both for education (mine and others) and for strength. Thing is, I don’t feel like anyone’s hearing the stories I’m sharing and telling but me and the folks who agree with me. 4) I don't think we can save Medicaid with the facts on Medicaid. We can only save it by making the intended thievery visible. Maybe. Stories aren’t working. Maybe “making the intended thievery visible” will. Anyway, I don’t understand how anyone could justify this Very Bad Thing. Maybe I could at least make the intended thievery and the strategies used to facilitate said thievery visible to me. As a critical discourse analyst, I’ve always appreciated how using CDA  gives me the analytical distance to face Very Bad Things that fill me with rage, that break my heart, that–were it not for my communication studies lens–I would not be able to look at. Doing CDA brackets my gut-wrenching emotional reaction for a time so I’m able to examine the Very Bad Thing closely and from multiple angles. I still sometimes break down and weep or jump out of my chair to pace and scream in the midst of working. But afterwards I can get back to it. So, I’m starting a new and rather urgent research program: studying #AHCA discourse on the right, paying particular attention to arguments in favor of the AHCA. I’ve identified some common framing–e.g., “repeal and replace”–that I’m gathering data on. I’ve collected some key texts that I think warrant in-depth analyses of their own. And I’ve only started to follow the money, but I’ll be working to better understand who benefits from the GOP’s health care plan and what’s being said about/by them. I’ll publish my findings on this blog. Here’s to making thievery visible. Let’s hope it makes a difference. The uninsured rate hasn’t been over 17% since the 1990s. By comparison, if we stay with ‘Obamacare,’ it’s estimated that 10% of US residents will be uninsured in 2026. The uninsured rate has dramatically and steadily dropped since the ACA Marketplace first opened in 2013. The original House version of the bill would have allowed insurance companies to charge more or deny coverage to people with pre-existing conditions. As I write, the Washington Post is reporting that a leaked draft of the Senate’s version retains “ACA protections for patients with preexisting conditions.” However, Andy Slavitt at USA Today reports that loopholes would maintain ‘protections’ but allow insurers to decline to pay for particular treatments. When I was uninsured, Planned Parenthood provided the only primary care I could access and afford. And it was quality, compassionate primary care. While I call contemporary discourse about the AHCA a ‘debate,’ I should also stress that it is an unusual one, given the unprecedented silence on the part of the people drafting the bill. I’ll explain CDA more in my next post. In a nutshell, critical discourse analysis or CDA is a method for studying the ways in which communication-in-use supports or undermines social injustice.